All New Mexico Department of Game and Fish regulations and seasons apply. 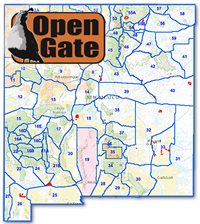 The Open Gate Interactive Map is intended to help hunters, anglers, and trappers locate private properties and right-of-way easements opened for public access through the Open Gate program. This map displays the location of Open Gate properties and right-of-way easements for reference purposes only. The New Mexico Department of Game and Fish (NMDGF) provides spatial data as a courtesy for general location purposes only. NMDGF makes no warranty and assumes no responsibility or liability for the accuracy, timeliness, completeness, or suitability of this data for any particular use.